An art teacher shares miscellaneous tips and tricks to familiarize elementary-school children with the basic materials and awaken their creativity. Beal is less concerned with philosophical questions about the nature or purpose of art than with the practical side of being an art teacher. Beginning with the injunction, “I think primarily in terms of art materials,” she offers sensible hints for arranging the art classroom, protecting clothing from stains, and structuring lessons appropriate for children at various developmental stages. The six chapters that follow each focus on a single medium: collage, drawing, painting, clay, printmaking, and construction. Each chapter consists of short sections on materials, techniques, appropriate adult responses and lesson plans arranged in no particular sequence, concluding with questions and answers for parents hoping to adapt the techniques for home use. 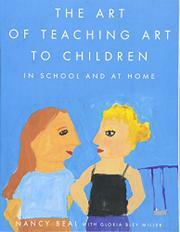 The chatty, informal tone is attractive, and parents and art teachers will make good use of the innumerable concrete suggestions for contriving materials and supplies, doubtless accumulated over years of classroom experience (transfer Elmer’s glue into baby-food jars, Beal urges, and always recondition used clay by poking a hole in it, filling it with water, and letting it sit in an airtight container before presenting it to a child). Parents and neophyte teachers will also benefit from her many examples of encouraging, thought-provoking responses to children’s creations. However, the conversational approach has its pitfalls. Spread over various chapters, the treatment of developmental stages and lesson-planning fizzles out into vague directives to have a sense of purpose. The loose organization of the chapters and the book as a whole, rambling among practical techniques, philosophical ruminations, and descriptions of children’s achievements, is also likely to frustrate any harried teacher or parent looking for substantial information on a particular medium, or an in-depth, focused discussion of educational strategies.